A new bag was on the top of my wish-list for some time now and since today it's my nameday (something which exists only for orthodox people if I'm not wrong) my parents were kind enough to buy me one of my favorites of this season. Lucky me I found it 30% off. You know, living in a country which struggles to avoid bankruptcy and survive from a serious economic crisis, you have to find ways to adjust. And looking for special offers or sales is a good way. Always knowing of course were your limits are. Well enough with these, what do you think about my new bag? 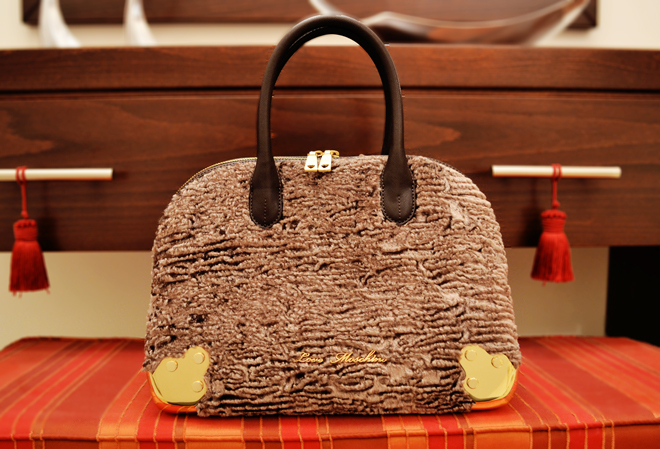 As for me, since it has fur, gold details and a gorgeous shape, do I need to say I love it? very pretty bag! Love it! Περιμένω να τη δω σε καποιο επόμενο post! Veronika I bought it at a department store in Greece, Notos Galerries. wow stunning bag great choice! Panemorfi! Megeia! Kai Xronia Polla! Na xairesai to onomataki sou! Ότι επιθυμείς να έχεις...με υγεία και αγάπη!!! Σας ευχαριστώ πολύ για τις ευχές σας, κ σεις ό,τι επιθυμείτε! Me geia sou!! H tsanta einai panemorfi! Xronia sou polla kai gia tin onomastiki sou giorti! Na se xairontai oi dikoi sou anthrwpoi!!! Kai panta blogoepityxies! τέλεια τσάντα, μεγειά σου κ από εμένα!